The San Diego Archaeological Center Library holdings focus on the anthropology, archaeology and history of San Diego County. Associated fields represented include marine life, ceramics, fauna, flora, geology and art. The catalog contains over 10,000 entries for books, journals, magazines, monographs, and media files; and over 2500 archaeological reports. The Center Library also contains a small collection of children’s books and an assortment of books about the California Missions. Catalog entry of materials is on-going and the on-line catalog will be updated periodically. The organization and catalog entry of maps is in the early stages. 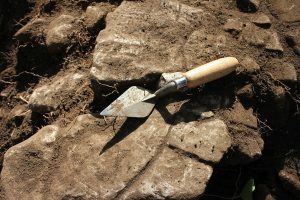 Almost 50% of the archaeological reports have been entered. The Center Library also has a number of digital reports, photographs, slides, audio and video cassettes that are in the process of being catalogued. For more information see The User Guide. There are two databases that can be searched. There is one for books, journals, magazines, maps and monographs. There is a separate database for archaeological reports that can only be searched with a password. Take a look at our User Guide section for further information. Click here to search the library. Monday – Friday 10:00am – 3:00pm. The Library is closed weekends, and Federal holidays. Appointments are recommended. Please contact the Center Librarian Suzanne Moramarco at 760-291-0370, or email at smoramarco@sandiegoarchaeology.org or library@sandiegoarchaeology.org. The Library can always use volunteers to perform a variety of tasks, including cataloging, labeling, sorting and repairs. Donations, small and large, are always welcome. If donated materials do not match the scope of the Library’s holdings, they will be placed in the Center’s Recycled Knowledge section of the Gift Shop. The Library reserves the right to not add donations to the collection and dispose of such items as appropriate. Past donors have included the San Diego County Archaeological Society, and Dr. Raymond Starr, history professor, who donated their entire libraries to the Center. The collection of Dr. Starr includes many biographies of notable San Diegans as well as his Personal files containing newspaper and magazine clippings, written oral histories and notes from his many years as a history professor at San Diego State University.